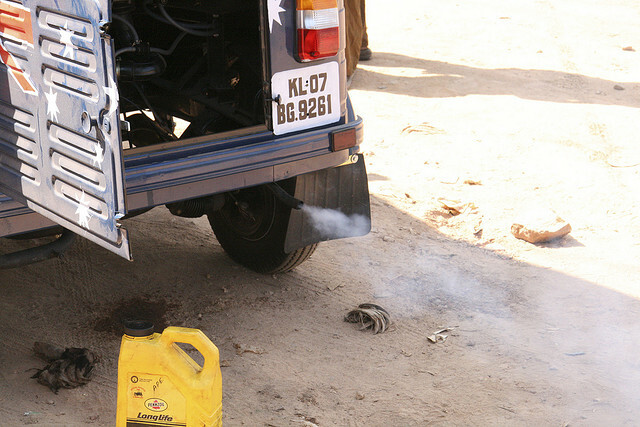 Hydrogen fuel could soon replace gasoline and diesel for some auto-rickshaws in India. Photo by Marc Roberts. Auto-rickshaws are a mode of low-cost, point-to-point transportation in Indian cities. The use of two-stroke engines running on gasoline and diesel, coupled with poor maintenance, often results in high pollutant emissions, particularly particulate matter and hydrocarbons. There have been a number of initiatives in recent years to improve fuel efficiency and reduce emissions, and a number of Indian cities have shifted to alternate fuels, such as compressed natural gas (CNG) and liquefied petroleum gas (LPG). However, one of the key caveats associated with these fuels is that oil is still added in the two-stroke version of the vehicle, which can contribute to a considerable amount of pollution. To fulfill the twin objectives of high energy efficiency and less pollution, research is now underway to assess the feasibility of hydrogen-fueled auto-rickshaws. Hydrogen, being a clean, non-polluting source of energy, can potentially contribute towards energy security of the country, as well as help in achieving reductions in air pollution and greenhouse gas emissions. More recently, at the Auto Expo that concluded last month in New Delhi, Mahindra showcased its new hydrogen-fuel auto-rickshaw, HyAlfa, which has been touted as the world’s first hydrogen auto-rickshaw. The project cost nearly $1 million and was co-financed by Mahindra & Mahindra and United Nations Industrial Development Organization’s International Centre for Hydrogen Energy Technologies (UNIDO-ICHET). Experts at the Indian Institute of Technology Delhi designed and tested the vehicle, which was then adapted and manufactured by Mahindra & Mahindra. A fleet of 15 auto-rickshaws is currently on a trial run at Pragati Maidan, an exhibition complex in Delhi, but the rickshaws are not expected to enter commercial markets until 2020. Commercial viability of the hydrogen-fueled auto-rickshaws remains to be seen, but the introduction of the auto-rickshaw to the market is a positive ste towards cleaner and less polluting transport systems.